Do you know just how valuable an appropriate indoor temperature is? Setting the right temperature is important to both your comfort and your wallet. We still have a long winter ahead of us here in North Carolina, so you’ll likely be using your heating system consistently over the next few months, and the primary way that you interact with your heating system is through the use of your thermostat. Upgrading your thermostat in Hickory, NC is a great way to save money this winter, and throughout all the seasons to follow. Today, smart thermostats grant homeowners ultimate control over their HVAC systems, allowing for improved efficiency and hundreds of dollars in savings. So, if you have an old, outdated thermostat, consider making the switch to a new, smart thermostat today. To convince you further, we have outlined just some of the benefits of upgrading your system. Keep reading below to learn more. A manual thermostat is any thermostat that you set by using a dial or a sliding switch. If you own one of these thermostats, you know just how hard it can be to tell exactly what the temperature is just by looking at those tiny, little marks. Just by missetting the temperature by a couple degrees, you can really drive up your energy bills. When the temperature you think you’ve set doesn’t match the temperature you feel, you might find yourself continuously making adjustments, which can take a real toll on your furnace or air conditioner. A smart thermostat with a digital display eliminates this confusion altogether, so you can be confident that the number you see on the thermostat is correct. Smart thermostats are capable of creating heating and cooling programs based on your personal schedule. Far too much energy is wasted heating or cooling unoccupied spaces in the home, which is why programming is so valuable. During winter, lowering the temperature by just a few degrees at night or while your away at work can save you a lot of money on heating costs. A programmable thermostat makes it so that you’ll never have to worry about forgetting to adjust the temperature when you leave your home — it’ll do it automatically. Plus, some smart thermostats are so smart that they even learn you and your family’s heating and cooling habits, allowing for a more individualized and highly-specific program. Many smart thermostats have WiFi capabilities, granting homeowners remote access to their HVAC systems. 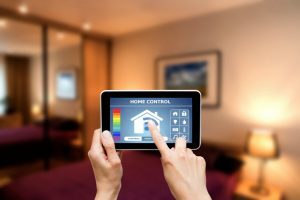 As long as you have a smartphone, tablet, or computer with internet access, you will be able to adjust your heating or cooling system from anywhere! In addition, smart thermostats with WiFi capabilities have the abilities to learn and study your habits to find the most preferable, efficient settings for you and your home. Plus, many smart thermostats highlight opportunities where you can save even more money! To learn more about smart thermostats, contact the experts at Canella Heating & Air Conditioning, Inc.